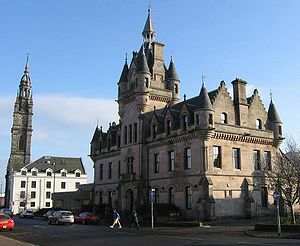 The Sheriff Court in Greenock (1869) is a typical Scottish Baronial Revival building with crow-stepped gables and corbelled corner turrets. Scottish Baronial is an architectural style that developed during the 16th and 17th century and was revived in the 19th century. The style of the first period, the original Scottish Baronial style, was limited to small castles and tower houses in Scotland and Ulster. It introduced Renaissance elements to buildings that preserved many of the features of the Scottish medieval castles and tower houses. The style of the second period, the Scottish Baronial Revival, was considered a British national idiom and was widely used for public buildings, country houses, residences and follies throughout the British Empire. European architecture of the 19th century was dominated by revivals of various historic styles. This current took off in the middle of the 18th century with the Gothic Revival in Britain. The Scottish Baronial Revival is often associated with the Gothic Revival because it includes so many medieval features. However, it originated as a vernacular variety of Scottish Renaissance architecture. The Scottish Baronial Style is also called Scotch Baronial, Scots Baronial or just Baronial Style. The name was invented in the 19th century and may come from Robert William Billings's book "Baronial and Ecclesiastical Antiquities of Scotland", published in 1852. Before, the style does not seem to have had a name. The buildings produced by the Scottish Baronial Revival by far outnumber those of the original Scottish Baronial Style. The original and the revival styles are discussed separately below. Claypotts Castle consists of a rectangular central block with two round towers crowned by square garret chambers. The corners of these chambers or cap-houses are strongly corbelled out over the round form and have crow-stepped gables. The original Scottish Baronial Style was part of the Scottish Renaissance. It developed in the 16th century and was abandoned by about 1660. The style kept many of the features of the high-rising medieval Gothic castles and introduced Renaissance features. The high and relatively thin-walled medieval fortifications had been made obsolete by gunpowder weapons but were associated with chivalry and landed nobility. High roofs, towers and turrets were kept for status reasons. Renaissance elements were introduced. This concerned mainly the windows that became bigger, had straight lintels or round bows and typically lacked mullions. The style drew on tower houses and peel towers, retaining many of their external features. French Renaissance also kept the steep roofs of medieval castles as can be seen for example at Azay-le-Rideau (1518), and the original Scottish Baronial style might have been influenced by French masons brought to Scotland to work on royal palaces. The style was quite limited in scope: a style for lesser Scottish landlords. The walls usually are rubble work and only quoins, window dressings and copings are in ashlar. Sculpted ornaments are sparsely used. In most cases the windows lack pediments. The style often uses corbelled turrets sometimes called tourelles, bartizans or pepperpot turrets. The corbels supporting the turret typically are roll-moulded. Their roofs were conical. Gables are often crow-stepped. Round towers supporting square garret chambers corbelled out over the cylinder of their main bodies are particular the Scottish Baronial style. They can be seen at Claypotts, Monea, Colliston, Thirlestane, Auchans, Balvenie, and Fiddes. Such castles or tower houses are typically built on asymmetric plans. Often this is a Z-plan as at Claypotts Castle (1569–1588), or on an L-plan as at Colliston. Roof lines are uneven and irregular. The original Scottish Baronial Style coexisted even in Scotland with northern Renaissance architecture, which was preferred by the wealthier clients. William Wallace's work at the North Range of Linlithgow Palace (1618–1622) and at Heriot's Hospital (1628–1633) are examples of a contemporaneous Scottish Renaissance architecture. The Baronial style as well as the Scottish Renaissance style finally gave way to the grander English forms associated with Inigo Jones in the later part of the seventeenth century. Dunrobin Castle is largely the work of Sir Charles Barry and similar to the ornate conical turrets, foundations and windows of contemporary restorations such as Josselin Castle in Brittany. Balmoral Castle shows the final Victorian embodiment of the style. A principal keep reminiscent of Craigievar is the middle of the castle, while a large turreted country house is attached. The Gothic Revival in architecture has been seen as an expression of romanticism and according to Alvin Jackson, the Scots Baronial Style was "a Caledonian reading of the gothic". Some of the earliest evidence of a revival in Gothic architecture is from Scotland. Inveraray Castle, built starting from 1746 with design input from William Adam, incorporates turrets. These were largely conventional Palladian style houses that incorporated some external features of the Scots baronial style. William Adam's houses in this style include Mellerstain and Wedderburn in Berwickshire and Seton House in East Lothian, but it is most clearly seen at Culzean Castle, Ayrshire, remodelled by William Adam from 1777. Large windows of plate glass are not uncommon. Bay windows often have their individual roofs adorned by pinnacles and crenulations. Porches, porticos and porte-cocheres, are often given the castle treatment. An imitation portcullis on the larger houses would occasionally be suspended above a front door, flanked by heraldic beasts and other medieval architectural motifs. Important for the adoption of the style in the early nineteenth century was Abbotsford House, the residence of the novelist and poet Sir Walter Scott. Rebuilt for him from 1816, it became a model for the Scottish Baronial Revival style. Common features borrowed from 16th- and 17th-century houses included battlemented gateways, crow-stepped gables, spiral stairs, pointed turrets and machicolations. Orchardton Castle near Auchencairn, Scotland is a superb example dating from the 1880s. Important for the dissemination of the style was Robert Billings' (1813–1874) four-volume work Baronial and Ecclesiastical Antiquities of Scotland (1848–52). It was applied to many relatively modest dwellings by architects such as William Burn (1789–1870), David Bryce (1803–76), Edward Blore (1787–1879), Edward Calvert (c. 1847–1914) and Robert Stodart Lorimer (1864–1929) and in urban contexts, including the building of Cockburn Street in Edinburgh (from the 1850s) as well as the National Wallace Monument at Stirling (1859–1869). Dall House (1855) and Helen's Tower (1848) have square-corbelled-on-round towers or turrets. The rebuilding of Balmoral Castle as a baronial palace and its adoption as a royal retreat from 1855–1858 by Queen Victoria confirmed the popularity of the style. This architectural style was often employed for public buildings, such as Aberdeen Grammar School (about 1860). However, it was by no means confined to Scotland and is a fusion of the Gothic revival castle architecture first employed by Horace Walpole for Strawberry Hill and the ancient Scottish defensive tower houses. In the 19th century it became fashionable for private houses to be built with small turrets. Such buildings were dubbed "in Scottish Baronial style". In fact the architecture often had little in common with tower houses, which retained their defensive functions and were deficient with respect to 19th-century ideas of comfort. The revival often adapted the style to the needs and technical abilities of a later time. In Ireland, a young English architect of the York School of Architecture, George Fowler Jones, designed Castle Oliver, a 110-room mansion of about 29,000 sq ft (2,700 m2), built in a pink sandstone similar to Belfast Castle. Castle Oliver had all the classic features of the style, including battlements, porte-cochère, crow-stepped gables, numerous turrets, arrow slits, spiral stone staircases, and conical roofs. This form of architecture was popular in the dominions of the British Empire. In New Zealand it was advocated by the architect Robert Lawson, who designed frequently in this style, most notably at Larnach Castle in Dunedin. Other examples in New Zealand include works by Francis Petre. In Canada, Craigdarroch Castle, British Columbia, was built for Robert Dunsmuir, a Scottish coal baron, in 1890. In Toronto, E. J. Lennox designed Casa Loma in the Gothic Revival style for Sir Henry Pellatt, a prominent Canadian financier and industrialist. The mansion has battlements and towers, along with modern plumbing and other conveniences. Another Canadian example is the Banff Springs Hotel in the Banff National Park in Alberta, Canada. The style can also be seen outside the empire at Vorontsov Palace near the city of Yalta, Crimea. The Baronial style peaked towards the end of the nineteenth century, and the building of large houses declined in importance in the twentieth century. The Baronial style continued to influence the construction of some estate houses, including Skibo Castle, which was rebuilt from 1899 to 1903 for industrialist Andrew Carnegie by Ross and Macbeth. Isolated examples included the houses designed by Basil Spence and built at Broughton Place (1936) and Gribloch (1937–1939), which combined modern and Baronial elements. The 20th-century Scottish Baronial castles have the reputation of architectural follies. Among most patrons and architects the style became disfavoured along with the Gothic revival style during the early years of the 20th century. ^ MacKechnie, Aoughus; Glendinning, Miles (2019). Scotch Baronial - The Architecture of Scotland and Unionist Nationalism. London: Bloomsbury. ISBN 978-1474283472. ^ a b Billings, Robert William (1852). The Baronial and Ecclesiastical Antiquities of Scotland, Volume 1 (1901 ed.). Edinburg: Oliver & Boyd. p. 6. Retrieved 8 October 2018. From the year 1500 to 1660 or therabouts, Scotland adopted the sterner features of French and Flemish residences, and so cleverly mingled their peculiarities with the castellated architecture of their own growth as to produce a Baronial style peculiar to the country. ^ Billings, Robert William (1845). The Baronial and Ecclesiastical Antiquities of Scotland, Volume 1 (1901 ed.). Edinburg: Oliver & Boyd. ^ Jackson, Alvin (2011). The two Unions: Ireland, Scotland, and the Survival of the United Kingdom , 1707-2007. Oxford University Press. p. 152. ISBN 0-19-959399-X. ^ I. D. Whyte and K. A. Whyte, The Changing Scottish Landscape, 1500–1800 (London: Taylor & Francis, 1991), ISBN 0-415-02992-9, p. 100. ^ a b L. Hull, Britain's Medieval Castles (London: Greenwood, 2006), ISBN 0-275-98414-1, p. 154. ^ Paterson, George B L (1983). Orchardton House, Auchencairn, by Castle Douglas. University of Glasgow, Mackintosh School of Architecture: University of Glasgow. pp. 17, 21, 30, 38, 56–57. ^ T. M. Devine, "In bed with an elephant: almost three hundred years of the Anglo-Scottish Union", Scottish Affairs, 57, Autumn 2006, p. 11. ^ M. Glendinning, R. MacInnes and A. MacKechnie, A History of Scottish Architecture: from the Renaissance to the Present Day, (Edinburgh: Edinburgh University Press, 2002), ISBN 978-0-7486-0849-2, pp. 276–85. ^ H.-R. Hitchcock, Architecture: Nineteenth and Twentieth Centuries (New Haven, CT: Yale University Press, 4th edn., 1989), ISBN 0-300-05320-7, p. 146. ^ a b c D. Mays, "Housing: 4 Country seat, c. 1600–Present", in M. Lynch, ed., Oxford Companion to Scottish History (Oxford: Oxford University Press, 2011), ISBN 0-19-969305-6, pp. 326–8. ^ "New hotel is Scotland's first castle of the 21st century". Sourcewire. 10 August 2007. Freewebs.com: The Scottish Baronial: an introduction and illustrations of five notable examples. Craigends.org.uk, a detailed study of "David Bryce's lost masterpiece", demolished in 1971. Castle-oliver.com, photographs and history of a recently restored Scottish Baronial masterpiece. This page was last edited on 10 November 2018, at 22:01 (UTC).